A wild elephant headed for the bright lights of downtown after being forced to leave his herd by another male on Sunday. He cut a lonely figure as he wandered the streets of Meng'a in southwest China's Yunnan Province, destroying nine cars as he went. The elephant was led back to the safety of the forest after 30 minutes. Local forestry station staff used a drone to record the Asian elephant's visit to the nearby community. The footage shows the massive animal looking somewhat lost as he explores the downtown streets. 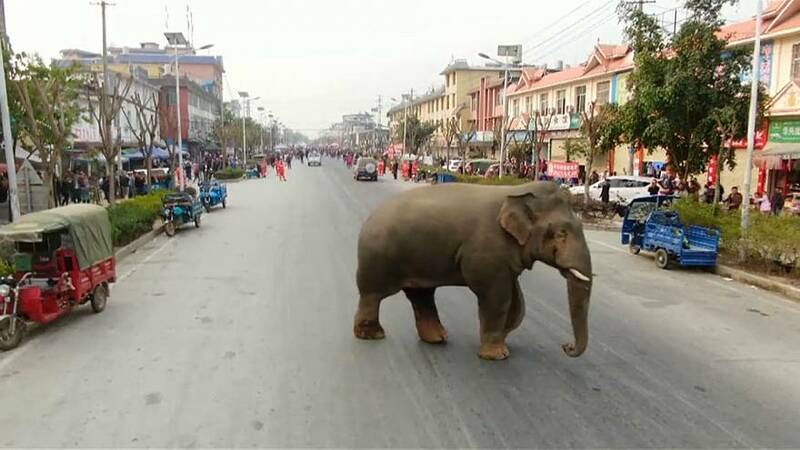 Public workers evacuated pedestrians and cars along his path and tried to guide the elephant towards the forest, but failed. Eventually, they contacted local police and firefighters, who managed to lead the animal away to safety. He was feeling down because another male elephant in his herd kept forcing him away. The Asian elephant, a first-class protected wild animal in China, is the largest-living land animal in Asia and is found only in Yunnan Province. Brief from Brussels: What's the fuss about China and 5G?